Prologue, before I get into this looney-bin: After the shootings in California a few weeks ago, everything/one has been rather hysterical on the internet. We’re all bothered, confused, and feeling defensive. It’s hard to know the right way to say what we’re thinking, and we’re ending up disagreeing with each other when it doesn’t even make sense to. I’ve been scared, angry & frustrated. However, I’ve also felt really encouraged by the stubborn men in my life who are fighting for the well-being of all, and by so many women who get right back up after they feel beaten down. The womb of the world is wandering the earth, trying to find it’s way home. This, here, is an artifact of this hysteria. It was a wacky aside, that wasn’t connected with anything I had thought about or said, which made it sound all the more appropriate for the level of communication happening these days. 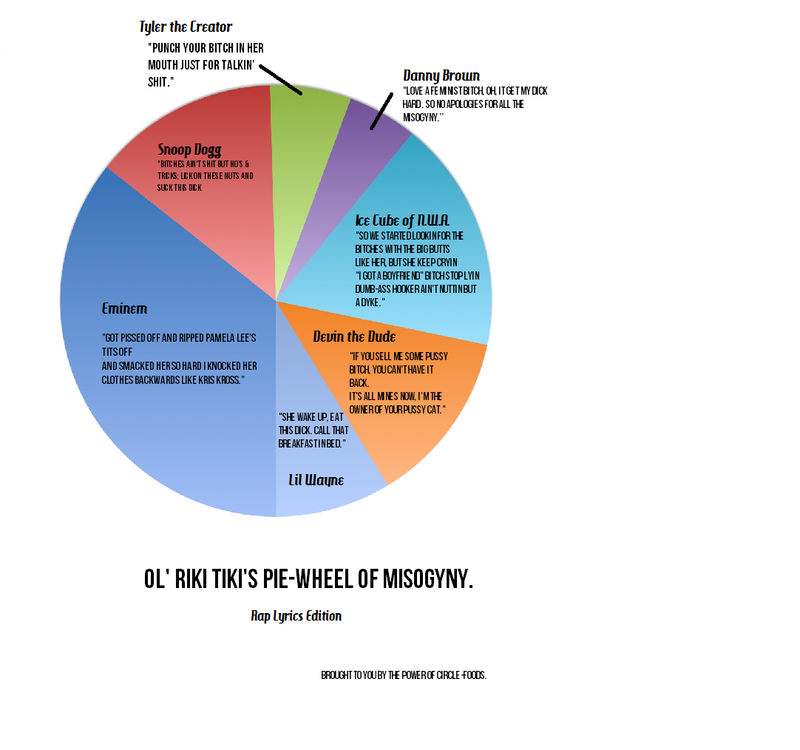 It’s far from “killer pie chart,” but it’s a pie with offensive rap lyrics written on it. I’ve been into rap since I was a middle-schooler and have many misogynistic lyrics written on my heart and ready to share. Rap is embedded into many pies I’ve made, and the most common album I listen to whilst pie-making is 36 Chambers, which, sadly, doesn’t dish out as large of portions of misogyny as many other albums. Though it certainly has some. The differently sized-portions of pie represent how offended I become when I sing the lyrics to myself, I guess. I’m bad at MS Paint so you’ll probably have to enlarge the image in order to read the offensive-stuffs.